First published in 1946 (and now back in print courtesy of NYRB Classics), More Was Lost is a remarkable memoir by the American-born writer, editor and keen gardener, Eleanor Perényi. In essence, the memoir covers the early years of Eleanor’s marriage to Zsiga Perényi, a relatively poor Hungarian baron whom she meets while visiting Europe with her parents in 1937. It’s a gem of a book, both charming and poignant in its depiction of a vanishing and unstable world, all but swept away by the ravages of war. I hope to find a place for it in my end-of-year highlights. Eleanor Stone is just nineteen years of age when she is captivated by Zsiga, an unconventional, liberal man with a keen interest in people. At thirty-seven, Zsiga is somewhat older than Eleanor, but personality-wise he is a good match; so, following a short courtship and engagement, the pair marry and ultimately make their way to Zsiga’s Ruthenian estate at the edge of the Carpathian Mountains. While the Perényis have little money to speak of, their assets are substantial as the estate comprises 750 acres of gardens and farmland, a vineyard, a distillery and a sizeable forest. The baroque property itself is characterful but dilapidated and in significant need of repair – there is much work to be done to make the dwelling comfortable for the newlyweds. While the Stones are fearful for their daughter’s future in an unfamiliar land, Eleanor herself is much more optimistic, buoyed by the richness of her new life with Zsiga. Money is of little importance to her, particularly compared to the pleasures of the estate. The first two-thirds of the memoir focuses on Eleanor’s adjustment to her new world, situated as it is on the shifting borders between Hungary and Czechoslovakia. At the time of her arrival, the area surrounding the estate is under the auspices of the Czechs; however, as Zsiga speaks Hungarian, this is the language she decides to learn, aided by the trusty Györffy, a long-standing employee of the Perényi family and manager of the estate. Alongside her lessons, Eleanor must also get to grips with managing the household, the gardens and ultimately the orchard, all of which need regular care and attention. There is little time for her to feel bored, especially as there are several renovations and refurbishments to be made around the house. With her flair for colour and interior design, Eleanor sets about rearranging and furnishing the rooms, rescuing past glories including paintings, maps and a collection of old books, many of which belonged to Zsiga’s grandfather, Alexei. With most of the ground floor given over to the kitchen, office and storerooms, the Perényis establish their living quarters in the upstairs rooms of the house, complete with a new library furnished by Eleanor. This section of the memoir reads like a sequence of vignettes – snapshots of the Perényis’ lives as they lovingly restore the estate. There are local dignitaries to visit, traditional festivities to host, and strange customs to uphold, all of which Eleanor handles beautifully – she doesn’t seem phased by any of it. In one particularly evocative episode, the couple cross the border into Hungary to stay with Zsiga’s cousin Laci, a larger-than-life character with an enormous bushy beard. Eleanor is captivated by Laci and his dashing friend, Bottka, with their enduring stamina and thirst for enjoyment. All too soon, however, developments in the outside world begin to impinge on the Perényis’ existence, and their position in the liminal zone between borders becomes all too perilous. Eleanor is acutely aware that if Czechoslovakia were to enter the war against Germany, Zsiga’s status as a Hungarian national would lead to his internment as a foreign subject. The situation in Europe is changing fast; too fast for Zsiga to arrange for Czech citizenship to secure his position. So, after much soul-searching, the couple make a dash for the border in the hope of making it into Hungary and back to Budapest. They make it, but only just – crossing the border at the last barrier where the frontline defences are in the process of being established. Back in Hungary, the Perényis find themselves caught up in the schizophrenic, illogical nature of Hungarian politics. As the disputes over the Czech territories rumble on, the couple dearly hope that their area will be returned to Hungary. (While a continuation of life under the Czechs would be perfectly acceptable, all hopes for the nation’s survival are rapidly ebbing away; it seems merely a matter of time before the capitulation occurs.) Alternatively, the prospect of being ruled by the Ruthenians is unthinkable, a situation that would leave the Perényis exposed to the whims of barbarians. I won’t reveal how the decision on these territories works out for Eleanor and Zsiga; you’ll have to read the memoir yourselves to discover the outcome. Suffice it to say that there are testing times ahead for this couple as they try to navigate the turmoil of war. More Was Lost found its way onto my radar when Dorian wrote so enthusiastically about it back in 2016 (do take a look at his posts which you can find here). It is by turns beautiful, illuminating, poignant and sad; one of those rare books that feel expansive in scope yet intimate in detail all at once. There is a sense of lives being swept up in the devastating impact of broader events as the uncertainty of the political situation begins to escalate. The pivotal decisions that Eleanor and Zsiga must take are conveyed with clarity and openness, qualities that make their story all the more moving to read. Perényi is a wonderful writer, describing her life on the estate and the changing of the seasons with great attention to detail. There are some beautiful descriptive passages in the book, from the snowy landscapes of the surrounding areas to the grand portraits and photographs of Zsiga’s ancestors – the last remnants of an idyllic vanished world. 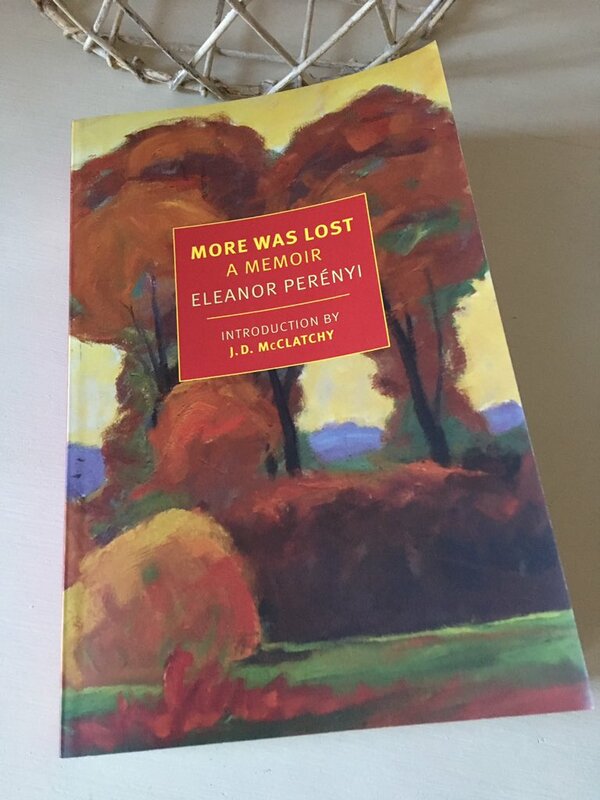 The book comes with a lovely introduction from J. D. McClatchy, an author and close friend of Perényi, which outlines what happened to Eleanor and Zsiga both during and after the war. Like many introductions, it is probably best left to the end to avoid any spoilers. All in all, this is a superb memoir written in a thoroughly engaging, straightforward style. Very highly recommended, particularly for readers with an interest in the period. More Was Lost is published by NYRB Classics. Huge thanks to Dorian for kindly gifting me a copy of the book. This entry was posted in Book Reviews, Perényi Eleanor and tagged #ReadWomen, Book Review, Eleanor Perényi, Hungary, Memoir, Non-fiction, NYRB Classics, US, WW2 on February 19, 2019 by JacquiWine.